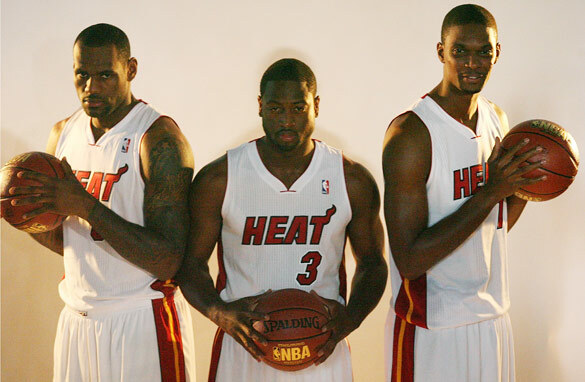 (From left to right) LeBron James, Dwayne Wade and Chris Bosh form a formidable trio for the Miami Heat this season. The new NBA season tips off on October 26 with a mouth-watering clash as the new-look Miami Heat visit the Boston Celtics. That game will be a fitting opening to what is arguably the most anticipated basketball season since Michael Jordan retired from the Chicago Bulls back in 1998. During the off-season, the Heat pulled off perhaps the greatest coup in the history of the league by re-signing Dwyane Wade and acquiring free agents LeBron James and Chris Bosh from the Cleveland Cavaliers and Toronto Raptors respectively. It wouldn’t be a stretch to say that Wade and LeBron are two of the top-three players in basketball alongside the L.A. Lakers’ Kobe Bryant. Add to the duo a top-five big man in Bosh, and the Heat have all the ingredients to not only compete for multiple championships over the next five years, but even challenge the all-time single season wins mark of 72 set by the Bulls in 1996. Basketball fans are used to seeing the top stars battling it out in the past. Larry Bird vs. Magic Johnson in the 1980s, Michael Jordan vs. Charles Barkley and Patrick Ewing vs. Reggie Miller in the 1990s are just some of the big-name rivalries the NBA had to offer, but the Heat’s new trio went in a completely new direction by deciding to join forces. Some might argue that the Celtics began the trend in 2007 when they brought in Kevin Garnett and Ray Allen to play alongside Paul Pierce. Even though they went on to win the title in their first season together, the Boston trio was not even close to such star power as the new-look Heat. Is it ok to hate the Miami Heat? Yes, they will be too good to like! Believe it or not, the super power that is the Heat is not the only talking point ahead of the new season. The two-time defending champion Lakers are looking to make it a three-peat for coach Phil Jackson. Jackson, who’s won a record 11 championships, is uncertain if this will be his last season. But if he does end up retiring, he will undoubtedly prefer to do it after a fourth career three-peat. Another title for the Lakers come June would also be Bryant’s sixth overall, which would equal the championships Jordan won during his career. For that to happen, Bryant has to recover from a nagging knee injury and hope the rest of the roster stays relatively healthy. Including Bryant, seven Lakers that should see significant minutes are 30 years old or older. Last season’s losing finalists, the Boston Celtics, added Shaquille O’Neal from the Cavaliers and Jermaine O’Neal from the Heat. After the Lakers badly out-rebounded Boston in Games 6 and 7 of the Finals last season, the Celtics hope the O’Neals are just what the doctor ordered. Alongside Boston and Miami, the East should be loaded this season. Dwight Howard and the Magic will look to return to the Finals after a one-year absence, while the Chicago Bulls quietly assembled a very competitive team after missing out on free-agents Wade, LeBron and Bosh. The Bulls instead got big man Carlos Boozer and sharp-shooter Kyle Korver, both from the Utah Jazz, to play alongside stars Derrick Rose and Joakim Noah. Boozer, who’s been injury-prone throughout his career, will miss the first month of the season after breaking his hand. According to Boozer, he tripped over a bag while attempting to answer the door at his home in early October. If the Bulls can stay healthy after his return, they should challenge for a high seed right behind the Magic and Celtics. But for all the other off-season moves, none will be scrutinized more than LeBron’s decision to leave the Cavs for Miami. LeBron is now the sixth-most disliked sports personality in the United States according to the Q Score company. When asked of the fans’ new dislike of him in an interview with CNN, LeBron pointed out that Tiger Woods and Kobe Bryant are ahead of him on the dislike list. He said that in order to be successful, you have to be hated. Many former stars have had their fair share of comments on LeBron’s migration to South Beach. Barkley, who is now an NBA analyst, said that LeBron’s legacy would have benefited more from winning a title in Cleveland, rather than Miami. Barkley also said that no matter how many titles LeBron wins in Miami, the Heat would always be Wade’s team. Even Jordan spoke out by saying that he never would have called Magic or Bird and asked them to play on the same team. You figure it’s against his competitive nature. Jordan wanted to beat Magic and Bird, not win with them. It seems that after seven championship-less seasons in Cleveland, LeBron chose the mantra “if you can’t beat them, join them.” And for that reason fans outside of Miami this upcoming season can be forgiven for hating the Heat. This hating the Heat bandwagon is getting to be a little much. As the article mentions, the Celtics acquired Garnett and Ray Allen a few seasons ago and have since acquired Shaq and Jermaine O'Neal in order to fill holes in their roster. Shaq and Kobe – then thought to be two of the most dominant players in the league – teamed up for what... 8 seasons? And when they stopped getting it done Shaq left for Miami. He's been on 3 teams since then. This is what teams do. And unless you are lucky enough to have an entire program built around you (which Jordan, Kobe and Lebron in Cleveland all had) AND have it backed up with world class coaching and mgmt (which Cleveland did not have), this is what players do. There are reasons for being disappointed at Lebron not being able to bring a championship to Cleveland. But hating him for taking his chances elsewhere is naive. It`s not so much that Lebron left for a new team but the way in which he left. That narcissistic one-hour special on ESPN ¨The Decision¨ in which he ripped the heart out of an entire city in front of a live TV audience was disgusting. The hate is well-deserved. Why not? Hate is a growth industry in America today. Wade, James, and Bosh have nothing to do with Jordan, Bird, Magic or whoever. They saw an 'opportunity' for themselves and took it...how American is that? Too American for a White-controlled sport supported by a White-controlled media? What's the matter...you don't want to pay these guys for having fun and making money? Save your hate, America. You'll need it for the real bad guys in your future. What a disappointment, since the idea was not made in some media room or board room it's not legitimate. I hope these guys win 3 championships and then move to China...then you'll have something to hate...but frankly haters don't really need a reason...as these 3 young Black men can surely attest. These young men are not owned by you people or the owners of these teams. As long as they honored their contracts through the ends how in the hell can you practice the rhetoric of hate. You people are a piece of work – how dare you continue this hate filled piece. And then you talk about bulleying – give me a break. Plantations are a thing of the past – come on out into the 21st century. The people that REALLY love the game will be happy to see these three awesome guys playing together period. LeBron did not have enought team in Cleveland to win a championship so he decided to move on. I don't see the crime. GOOD FOR THE GAME !! Lebron james took a dump on the city of cleveland on national television. This is a city that has already been hurting badly and it was made a fool of by james in front of the entire nation. Hate the heat. Wanting to change clubs is fine, but it's the manner in which you make or try to make your move that's the difference. Do it in a classy manner, showing a little respect and humility, explaining your reasons to those that care i.e management, coach and fans, and most times you'll get a hearty if reluctant farewell. Do it like Lebron did or Wayne Rooney tried to do, and you reap the rewards of your arrogance. Everyone hates you! Andy is right – enough of this 'hate' crap and get on with your lives. The media courted LEBRON to announce his decision live so that they can make money out of it. Some of it went to charity ( many seem to have forgotten that bit) and hats off to Lebron and his team for that generosity. Basketball is a game and lets not forget it. thats what happens when you put these type in basketball and make that kinda money!! ... i was a hugeee lebron fan, he lost a lot of respect after this move! I think a lot of people are forgetting who Jordan was playing with when he won those championships...oh yea Dennis Rodman arguably one of the best utility men to ever play in the NBA, and a physical up in your face defender. Lets not forget about Scotty Pippen, who's maybe one of the top 50 guards to ever play in the league. Who did Lebron have in Cleveland? Anderson Varejao is no Dennis Rodman by any comparisons, not a great physical defender but a good hustler, still there is no way you can consider him a starter on a championship caliber team. Lets continue with Mo Williams, nicknamed "Robin" for being the second best option after Lebron. If Batman had this Robin, he would have probably joined teams with the Joker too. Its just not fair to compare these two teams. One of them was led by a superstar where everyone knew their role and were going to do anything they could to win. The other squad would watch their superstar put on a show, but could not provide the support he needed. Its easy to hate Lebron for "abandoning" his state, but 1 man cannot win a championship. (1)Lebron and Bosh gave Cleveland and Toronto numerous years to bring in help......some came, but not enough. (2)Players need to view themselves as corporations rather than employees these days. Would YOU let someone else make money off your name and you be alright with that? --excuse the collegiate level unfortunately. (3) I pay to see the players, not the owners.......(4)Would Apple still be relevant today if it didn't bring back its most prized player and build the ultimate team around him??? NO. Andy- Shaq didn't "team up" with Kobe- Kobe was drafted. You might say that Gasol teamed up with Kobe but that was a trade (a ridiculous one yes), not a conspiracy like this was. Also Gasol is just one player, and the Lakers were favorites and an established team that was top of the West when he came anyway. The Celtics was an example of "teaming up" but thankfully they were already old when they joined forces, and Garnett is the utility player that Bosh isn't, so it could be tougher for the Heat, at least during the playoffs. And I hate the Heat for "The Decision", for their arrogance (like the concert and dancing instead of a simple preseason press conference as Charles Barkley said), bandwagon fans, and Bosh/Lebron's unwillingness to "lead" or truly be great. He is a sellout with no backbone or leadership. Hate is a dangerous feeling. Any responsible journalist, if not from Cleveland, Toronto or Chicago (where are you from, Mr. Krumov?) would avoid throwing gas to that fire. How would you feel if some lunatic inspired by your approval of such "hate" took matters in his own hands and showed, fisically perhaps, his personal and according to you accetable dislike for those great players? How many kids can get an education with their combined salary? y dont dey just leave lbj alone?.. it's his right as an nba player to stick to wherever team he wants, he left cavs with no vindication although it may not have been a graceful one because of the management's negative reactions. let's not hate people from moving on.. leave lebron alone. besides, it's his right not just as an nba star but as a human to decide and we should love it as much as he loves entertaining us with his sport talents and skills. cavs management did not react that good and it makes sense because they lost their precious gem but they have to accept reality that people move on for selfless and not selfish reasons..
Lebron gave Cleveland some good years. It's not his fault that, at the end, Cleveland was simply not good enough. For all his talent, he deserves to win a championship ring and he is making a move he believes is necessary in order to achieve this. He is an ambitious professional basketball player and there is nothing wrong with that. Whether moving to Miami will accomplish that, time will tell. If we have to hate him because of that then that says a lot more about us than it says about Lebron. Cleveland used to sing his praises for no reason other than the fact he played (very well) for Cleveland; now he has moved to Miami. Accept it, get a life and move on. He has. I'm from Brazil and i must say that this kind of report is, at least, irresponsible!!!! Hate is a very strong felling and should not be used to discribe any kind of Sport... That's why it's not a surprise to hear from America stories about teenagers carring guns and shotting people at school!!!! It seems that the press loves to use these terms, but you don't realize that you are, in fact, feeding violence... Basketball is just a sport, do not forget that!!! Hating someone who managed to get an increased salary and undoubtedly increased his chances to win a long-sought after championship after they spent the better part of a decade at their old job. Rid-ic-ulous. you gotta be kidding me, HATE KING JAMES, PLEASE.....I'm from Cleveland and he tried for a long time (7 yrs) to win in Cleveland but COULDN'T...Leave the man alone for wanting to win a championship....Who says that's a bad thing??? You Media people build up just to tear 'em down.....(we made you and we can break you sort of thing) FORGET IT!!! Andy, i have to say i disagree with you at some level. Kobe & Shaq were not "teamed up" as you suggest. Kobe was brought in as a rookie (not even in the top five for that matter) and stayed his first years in the bench as a substitute for Eddie Jones at the time. So, as you can see, its not the same Kobe we have today. It was totally by chance and not a plot to team up two of the best players in the league just so they could try and win more titles. Regarding Shaq... well... it doesn't take much to know that even with him playing for the Celtics (or any other team for that matter) doesn't scare people like it used to. In other words, Shaq (although still very useful) isn't a key player. The only example that fits the Miami situation is the Celitcs with additions of Ray Allen and Kevin Garnett! I have to admit... i love these all star rosters! And i love even more when a team such as the Lakers continues to win championships, even when facing these "super teams". I don't condemn Lebron for going to Miami, but in my subconscious it kinda made me lose respect for him... cuz the whole "if you can't beat them, join the them" thing... takes all the competitive spirit that Jordan talked about! Its about passion, love for the game and the ultimate desire to top your opponents.. even if against the odds! James just took the "easy street"! Getting out of Cleveland isn't the most shocking thing... if to another team it would be totally fine. Change of scenario! But this move to Miami was intentional in order to wipeout the competition... but well.. i don't agree if some one hates Miami, but i understand and i don't judge! Miami certainly has a bulls eye on their back. It's also a question if they have enough depth to get through the season without putting heavy minutes on the big three of the Heat. Hating the Miami Heat already started as soon as James and Bosh made it official. It will certainly make the Eastern conference a more interesting race in 2010-11. @Isaac & @Agostini, Diego – Are you the same person, or did one of you copy and paste the other's comment? To the originator, firstly, if you'll look up and to the right of this page, you might notice that Mr. Krumov is not listed as a journalist, but rather as a "Contributor" to a blog. As such, he is not bound by any journalism ethics, but is free to commentate on the issue at hand as he sees it. Secondly, as fans, we love to "hate" sports teams and players. It is our right and our duty. Notice, if you will, how the article does not in any way incite anyone to act in any manner against any player of the Miami Heat or the team itself, be it by boycotting games, rejecting apparel, or seeking a physical altercation. Suggesting that anyone acting with such extremity could be due to this blog is ludicrous, and in this particular case, you are quite clearly mistaken. Thirdly, Mr. Krumov has presented his thoughts on the subject succinctly, with a well-reasoned premise, included a littany of examples, and culminated his comments in an organized and on-the-point conclusion, much like a grown-up in fact. Feel free to agree or disagree with his statements by coming up with a reasonable rebuttal and a clear point. The hate is well-deserved, not because these guys are motivated by self-interest and want to win at all costs-can't fault 'em for that-but because of the tacky way they ditched their previous teams. There was Bosh and his ridiculous Tweeting and LeBron with his truly idiotic special which resembled a bad SNL sketch. Love Wade's game as he is a phenom, but the other two guys...to hell with 'em. Had no problem with the way Boston assembled their team but I want anyone but the Heat to come out of the East. Why isn't the hatred directed toward a Cleveland franchise who wasted 7 years of arguably the most talented player in basketball, because they couldn't or wouldn't surround him with a competitive supporting cast? How many more years do all you haters expect James to have remained in Cleveland? The minute his skills started to erode, he would have been jettisoned like yesterday's newspaper, but that's okay right? As long as he doesn't try to better himself and take advantage of his free agent status. This whole thing is partly an accident of all three players becoming free agents in the same year, a perfect storm, if you will. There's no way for Michael Jordan to predict what he would have done, because the opportunity never presented itself and he had already experienced success due to the excellent supporting cast the Bulls surrounded him with, something James didn't have. Lighten up and enjoy it, it's just sports, after all!